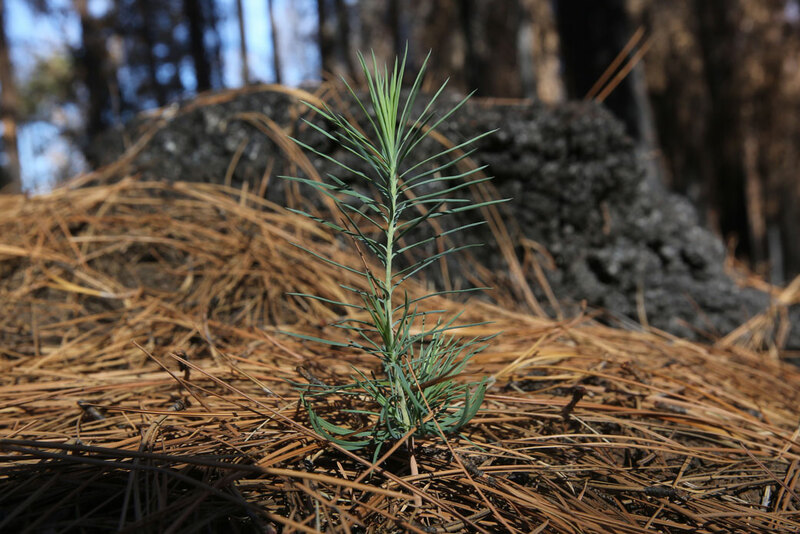 A young ponderosa pine tree grows in an area destroyed by 2013's Rim Fire, near Groveland, California, July 2014. Congress can use the farm bill to sustain the nation’s forests and create thousands of jobs by encouraging smart investments in the full range of natural resources and services that forests provide. The farm bill, which is up for congressional reauthorization in 2018, provides a ready-made opportunity for lawmakers to strengthen rural economies. Indeed, that goal was the impetus for the very first farm bill in 1933, which was passed to support struggling farmers who had lost their farms, crops, and earnings in the wake of the Dust Bowl—a period of severe dust storms brought on by drought, poor land management, and soil erosion that devastated the agriculture and ecology of the Great Plains.5 Today’s farm bill, which now encompasses a variety of agricultural, food, and conservation programs, can and should help ensure rural communities have the tools they need to thrive. Expanding innovation grants and collaborations that empower local communities and businesses. Forests are a critical part of the nation’s natural infrastructure, and maintaining the services they provide requires investments beyond the traditional timber considerations that have shaped their current form. Encouraging partnerships with drinking water utilities and other innovative uses of forest resources will help ensure that local communities can take full advantage of what forests have to offer. Forest restoration refers to a range of actions that aim to manage a forest in a way that reflects its historical ecological state in a certain place. This can include replanting or reintroducing native plants and animals, mechanical thinning and prescribed burning to replicate historical tree densities, removal of invasive species, or returning physical processes—for example, fire behavior, functioning streams and floodplains—to a more natural and resilient state. The goal of restoration is not to recreate a specific appearance, but to reduce the effects of past human activities, such as clearcutting and fire suppression, that keep a forest from functioning like it would in a natural state. This sort of approach to forest management provides economic and environmental values and helps land managers ensure the land will support communities by protecting natural resources including timber, wildlife, and water. In central Oregon, Blue Mountains Forest Partners has convened timber companies, environmental groups, ranchers, and county governments to work with the U.S. Forest Service on restoration and management of the Malheur National Forest.12 The group helps coordinate research on timber production, grazing, and restoration, and share those results with the communities that rely on the forest. It also uses this research to bring together groups and plan different forest uses to ensure that all management needs are being met for the community. The watersheds that forests grow within are at risk as well. New research from Conservation Science Partners found that more than 25,000 miles of rivers and streams within national forests in the West have been altered by human development.22 In addition, the USFS has estimated that 7,189 watersheds connected to national forest land—and covering more than 160 million acres of federal, state, and private land—have been significantly altered by past fires, adverse changes to rivers and streams, invasive plant species, and other factors.23 This reduces their capacity to filter drinking water and function as critical components of natural landscapes. Accelerating the USFS’s pace and scale of restoration would not only have a big effect on protecting watersheds and reducing the risks to communities from wildfires, but also provide a boon to rural economies. Forest restoration requires labor and machines, creating employment opportunities and supporting local businesses. And depending on the location and restoration technique, these projects can provide timber and other wood products, such as pulp or biomass energy, that support other businesses. The Forest Service estimates that between 65 million and 82 million acres of national forests are in need of restoration, which they define using the aforementioned data on wildfire hazard potential as well as aerial imagery of insect or disease-caused tree die-offs.24 Since 2010, the Forest Service has worked with partners to restore 2 million to 4 million acres annually across the country.25 This area is twice the size of Rhode Island, but there are still numerous communities, watersheds, and other resources that are vulnerable to fire, or otherwise in need of ecological restoration. If the USFS were to double the rate of restoration—which, conservatively, would amount to adding 2 million more acres a year—the agency could put a bigger dent in the backlog of restoration projects and create much-needed jobs for rural America. As an industry, ecological restoration already generates $24.5 billion in economic activity and directly provides 126,000 jobs in the United States.26 For every $1 million invested in restoration, between 12 to 30 jobs are created, depending on the level of mechanization used on-site.27 Based on average estimated restoration costs of $700 per acre for forest restoration, investing in an additional 2 million acres of restoration annually would create up to 42,000 jobs. The indirect economic effects would also be strong, as much of the restoration costs are paid to labor and the economic benefits stay within communities. To be sure, not all forest restoration proposals are created equal. Forest restoration is not a prescription for wholesale clear-cutting of forests, and it is impossible to achieve restoration goals—even improving public safety or sustainable timber management—by short-cutting important environmental reviews. 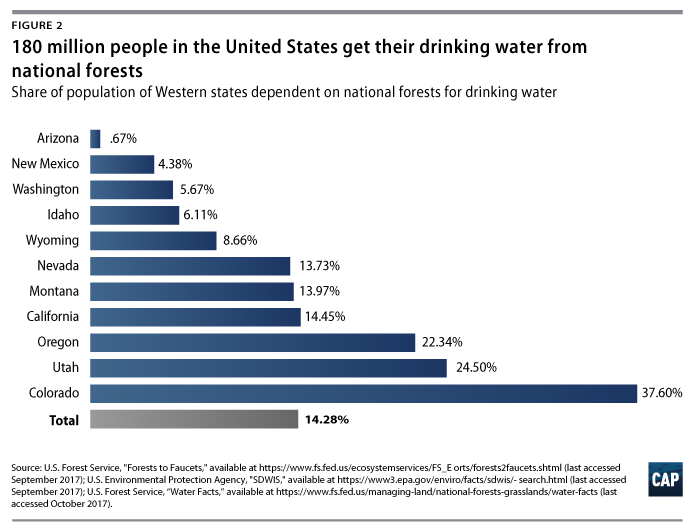 Instead, policies should enable the Forest Service to build from its own research on forest fire science, hydrology, and ecology to plan and prioritize restoration projects in national forests that protect critical watersheds, are close to human population centers, and/or provide important wildlife habitat. Without diving into those important issues, this report offers practical ideas for how the 2018 farm bill can help conservation and restoration of national forests. The argument for exorbitant categorical exclusions ignores the fact that NEPA is not the enemy: there are tens of thousands of NEPA-approved acres in the national forest ready for restoration. What is lacking is resources. Officials within USDA, including the secretary of agriculture and chief of the Forest Service, acknowledge that existing authorities already allow them to scale up restoration, and that the Forest Service has more partnerships with outside groups to conduct restoration than ever before in its history.31 Neither public records on litigation nor scientific evaluation of fire ecology support the argument that America’s bedrock environmental laws hinder forest restoration. Instead, exemptions to environmental review could make the dynamics of fire management more complex for the Forest Service and state agencies. Similarly, restrictions on public input would not reduce the potential for uncharacteristic wildfire, but may exacerbate the problem by focusing on fire suppression and harvesting approaches that are appealing to commercial timber activity and detrimental to rural communities and businesses that benefit from restoring natural fire patterns and watershed conditions. Through the 2018 farm bill, Congress can encourage investment in forests and nearby communities. First and foremost, policymakers should develop a comprehensive fix for the fire budget to ensure that fighting costly catastrophic wildfires does not come at the expense of other USFS programs, including restoration projects that help to reduce the severity and cost of wildfires. Second, policymakers can build upon new authorities from recent farm bills to leverage partnerships with state and private entities that expand the pool of funding for forest restoration. Finally, Congress should expand federal grants programs that spur innovation at the ground level, empowering local communities and businesses to pursue products and projects that have long-term benefits for forests and the people who depend on them. The costs of fighting wildfires are skyrocketing every year. Longer, hotter, drier fire seasons mean that more and more of the USFS budget is eaten up by fire suppression activities. 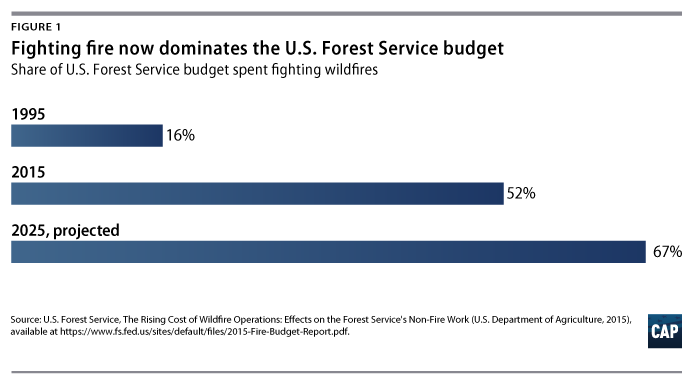 In fact, more than 50 percent of the USFS budget is now spent on fighting wildland fires, up from 13 percent in the mid-1980s.32 In order to prepare for fire season, the USFS now waits to allocate money for nonfire management purposes; federal law prevents the Forest Service from spending more money than it has, so other activities have to wait until the impact of a fire season is known. Ironically, diverting funds to firefighting means the Forest Service cannot invest in activities that protect public resources from future wildfires. Escaping this Catch-22 dynamic does not require wholesale changes to forest fire budgeting. In recent years, more than 30 percent of the USFS budget has been spent on fighting less than 2 percent of wildfires.33 As Congress reconsiders how to fund disasters following the powerful 2017 hurricane season, they should structure eligibility for federal disaster resources to include the worst 1 percent of wildfires. Treating fires as natural disasters—much like a hurricane or an earthquake—would allow the Forest Service to tap into a special account, rather than needing to siphon off funds intended for other important forest restoration activities. As an example of the benefits of such a fix, in 2015, the USFS spent more than $320 million to fight just 10 fires.34 Had that money alone been allocated to restoration activities, the USFS could have restored an additional 450,000 acres across the country.35 This investment could have lowered the risk of future large wildfires, protecting rural properties, timber, and outdoor recreation opportunities. It would have also created contracts for local businesses to conduct restoration, and generated upwards of 9,600 jobs, protecting natural resources and private property. While Congress has come close to passing a fix for wildfire funding in the past, the must-pass reauthorization of the farm bill in 2018 may be the perfect vehicle to finally get this much-needed change done. Healthy national forests provide huge benefits to society, including clean water and places for outdoor recreation. Businesses and state and local governments, therefore, have a vested interest in protecting this natural infrastructure. The 2018 farm bill could help the USFS accelerate these partnerships through the authorization of novel financial agreements between USFS and utilities, federal support for small utilities, and appropriations that allow USFS to scale up technical and contracting capacity. The 2014 farm bill made two big changes to USFS policy to support this approach for forest restoration: the permanent reauthorization of the USFS Stewardship Authority and a five-year authorization to extend the Good Neighbor Authority. The stewardship authority allows USFS and the Bureau of Land Management to enter into contracts with external groups for up to 10 years in order to achieve management goals, including forest restoration.40 The Good Neighbor Authority, previously only applicable in Colorado and Utah, was extended to all 50 states and Puerto Rico, to allow the Forest Service to enter agreements with state agencies to conduct certain types of restoration within National Forests where federal properties are adjacent to state lands.41 This makes it easier to manage across multiple property types, which is a common challenge in western watersheds. It is worth noting that these partnerships still take years to develop, as they require agreements between the USFS and a range of other organizations to plan, finance, and implement. As a result, most existing drinking water partnerships with the USFS have been made with larger utilities. However, new CAP analyses of U.S. Environmental Protection Agency (EPA) drinking water utility data show that nationwide more than 5.4 million people in rural counties are served by more than 2,800 small- and medium-sized utilities that rely on surface water sources for their drinking water.42 Smaller communities and the utilities that serve them face unique challenges in protecting their water supplies. In addition to a smaller base for raising funds, rural utilities are more heavily affected by necessary maintenance and upkeep commitments for existing built infrastructure.43 Protecting natural infrastructure often becomes a lower priority for these communities’ limited finances, leaving rural jurisdictions more exposed to the effects of forest fires. In order to ensure that smaller utilities also have the resources to protect the forests upstream of their water supplies, Congress should include a green infrastructure credit assistance program in the farm bill. This program could operate through the U.S. Department of Agriculture’s (USDA) Rural Development branch in a similar manner as the Rural Water and Waste Disposal Loan & Grant Program, through which utilities serving small communities are eligible for low-interest loans or one-time grants to help finance projects. Giving small communities and rural counties support to make proactive investments in their watersheds will improve their resilience to fire, safeguarding a vulnerable aspect of rural infrastructure. The farm bill can also ensure that the USFS has the technical capacity to expand its participating agreements with utilities for restoration. The projects mentioned above have helped USFS develop pilot agreements and contracting protocols, but more work is needed to prepare agency capacity for future projects and refine monitoring tools that can be used to expand the range of financing arrangements available to utilities and investors. The past several farm bills have provided support for local-level projects that better utilize the range of goods and services provided by forests. These include incentives to support innovation in conservation and the use of timber products, and grants to help multiple stakeholders partner with the Forest Service in large-scale forest restoration projects. The federal government can also support responsible forest restoration through investments in research and development of new timber products that utilize wood from restoration projects. This research can be conducted at the Forest Service’s Forest Products Lab, or a range of universities across the country, to help develop new building materials and construction techniques, like mass timber framing for high-rises and other structures. Identifying suitable products would create commercial demand for the products of forest restoration, as well as investment in wood processing and manufacturing jobs. The farm bill should continue to support these projects, expand their scope, and scale to maximize their impact. The CFLRP has achieved recognition for its high levels of project proposals, and for the external funding that has been leveraged to supplement federal support for project activities. Authorizing a larger number of projects and an expanded funding cap for the CFLRP would help accelerate the return of National Forest System lands to a more natural fire regime, and create thousands of additional jobs. The Conservation Innovation Grants have a track record of supporting compelling projects, but advancing good ideas within watersheds and regions may be better supported through programs such as limited loan guarantees for certain types of project, which help absorb some risk of moving from field-testing concepts to developing market activity. And supporting research into new technologies that utilize wood in construction will help open new markets, attracting investments that support stewardship and provide opportunities in rural economies. This is a critical juncture for the nation’s forests, as the effect of historical management practices and a changing climate threaten to dramatically impact both their ecology and the services they provide to society. Recent policy developments have made it easier to conduct some restoration activities, and have supported pilot projects to diversify financing to manage forests. However, the scale of the management needs associated with protecting rural communities, watersheds, and valuable forest resources far exceed the resources currently available to forest managers. The 2018 farm bill presents an opportunity to accelerate the pace of restoration. Recognizing major wildfires as the disasters that they are will help to reduce the impact of firefighting activities on the U.S. Forest Service budget and permit more money to flow to restoration activities. Although these activities are not a cost-saving measure in the short-term, it does allow for investments in restoration projects that can reduce fire risk to communities and natural resources that help support their economies, for example outdoor recreation. It also frees up Forest Service capacity, which will help attract new and innovative funding to protect community watersheds and other benefits that flow from healthy forests. This approach could potentially double the rate of restoration, creating tens of thousands of new jobs while reducing the risk of wildfires to properties and natural resources. Establishing programs that capitalize on the value of forests to downstream water users and to neighboring communities provides an opportunity to bring sustainable support to forest restoration by creating jobs, protecting communities, and improving America’s forest resources. Ryan Richards is a senior policy analyst for the Public Lands team at the Center for American Progress. The author would like to thank Mary Ellen Kustin, Kate Kelly, Jim Lyons, Kyle Cornish, Chester Hawkins, and Carl Chancellor for their contributions to this report.